Ben Meehan crosses for one of his two tries for London Irish. Photo: Brian Tempest. London Irish Rugby Club are potentially just one game away from sealing an immediate return to the Aviva Premiership. Declan Kidney’s charges can wrap up the Greene King IPA Championship title, and promotion, when they host Hartpury College at the Madejski Stadium on 14 April. 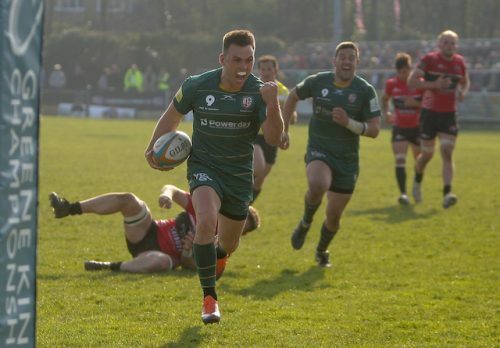 With three rounds to go in the Championship season, and Irish eight points clear at the top of the table, a win against Hartpury will be enough, provided closest rivals Ealing Trailfinders fail to win. 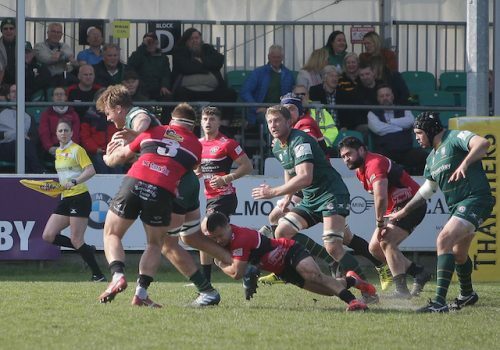 Ealing make the difficult trip to Jersey Reds on 13 April, so when Irish take to the field 24 hours later they’ll know exactly what they need to do. Jersey are one of only two sides to inflict a defeat on the Exiles this season, and one of those came at St Peter – Jersey’s home ground. Ealing won’t be expecting any favours from the Reds. Last weekend saw the Exiles move another step closer to returning to the promised land of the Premiership with a bonus-point win over Cornish Pirates at Mennaye Field. Kidney’s side won 35-7 thanks to tries from Tom Stephenson (2), Ben Meehan (2) and Ben Loader, at a venue where they suffered a defeat in December, albeit in the Championship Cup. No such problem this time around for Kidney’s side who were firmly in control by half-time, leading 21-0. The Exiles’ maximum five-point haul was matched, however, by Ealing, who ran in five tries in a 35-19 win over Nottingham. The contentious issue of relegation and promotion between the Premiership and Championship will be high on the agenda at Premiership Rugby’s next board meeting on 9 April. Talks have already taken place between Premiership bosses and the Rugby Football Union. It’s reported that the Premiership clubs favour a 13-team league, made up of the exiting 12 clubs plus London Irish. Any decision to scrap relegation would require the unanimous approval of all 13 Premiership shareholder clubs, which includes the Exiles. If the new structure was to be implemented it would ensure that the Exiles will be playing Premiership rugby when they move into their new stadium (Brentford Community Stadium) near Kew for the start of the 2020-21 season.